↑ Rashid al-Din asserts that Genghis Khan lived to the age of 72, placing his year of birth at 1155. The Yuanshi (元史, History of the Yuan dynasty records his year of birth as 1162. According to Ratchnevsky, accepting a birth in 1155 would render Genghis Khan a father at the age of 30 and would imply that he personally commanded the expedition against the Tanguts at the age of 72. Also, according to the Altan Tobci, Genghis Khan's sister, Temülin, was nine years younger than he; but the Secret History relates that Temülin was an infant during the attack by the Merkits, during which Genghis Khan would have been 18, had he been born in 1155. Zhao Hong reports in his travelogue that the Mongols he questioned did not know and had never known their ages. ↑ Ratchnevsky, Paul (1991). Genghis Khan: His Life and Legacy. Blackwell Publishing. प॰ 142. . "It is possible, however, to say with certainty that Genghis Khan died in August 1227; only in specifying the actual day of his death do our sources disagree." ↑ "Genghis Khan". Webster's New World College Dictionary. विलि पबलिसिङस्. २००४. http://www.yourdictionary.com/genghis-khan. अन्तिम पहुँच मिति: July 29, 2011. ↑ "Genghis Khan". Oxford Dictionaries Online. Oxford University Press. 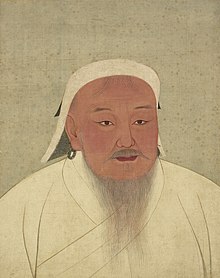 2011. http://oxforddictionaries.com/definition/Genghis+Khan?region=uk. अन्तिम पहुँच मिति: July 29, 2011.